Becoming a single mom was the best decision I ever made. How I came to make that choice is usually irrelevant but occasionally resurfaces in unexpected ways. My ex-boyfriends are a blur of letdowns, hurt feelings, stomachaches, and infidelities. Was it too much to ask to be prioritized and respected? After many years of beaus and breakups, I knew I’d be happier as a Solo Mom rather than coparenting in a disappointing relationship. Now I have a son, Spense, who ironically has had a wife since the day he started preschool, and I of course wonder if that is a reaction to my single status. He tells me that it’s normal for people to be married. I have always felt that growing up with a dominant female influence will make Spense into a kind and caring boyfriend someday. Respect for his partner will be in his marrow, like his obsession with marshmallows and baseball. You’re welcome, world. At age four, when Spense asked, “Mom, do they make toys of the Little Mermaid’s sisters? Because I really want them.” I was delighted. He and I play with Eric and Ariel toys. Sometimes other toys, such as Purple Squid or Batman and his boyfriend (a farmer toy Spense named Rosh Hashanah), visit the ocean kingdom. Love is love in the sea, as it should be everywhere. I bought Spense the mermaid sisters for Hanukkah. I couldn’t believe how excited he was, and I secretly lauded myself for excellent gender-fluid parenting. “Can I take a bath right now so we can play?” he asked. I offered to play mermaids with him in his room, but he needed authenticity. I filled the tub and he got in, parting the sea of tiny, white bubbles. “OK! Tell me each sister’s name,” he said. “Hi, Eric,” I said, in seven different voices. He made a disapproving face at the mermaid with a New Jersey accent and then continued. “Ariel . . . I need to break up with you,” Prince Eric said, with all the confidence and composure of a royal leader, his painted smile never wavering. “What!? Why? Eric, we love each other!” Ariel stammered. This is why he wanted all the new mermaids? How could a thought like this be possible in his post-toddler head? What did he even know of pretty? Besides the fact that all these mermaids looked identical, he seemed to prefer the blondes. Here I was thinking my everyday actions as a Solo Mom showed him that women decided for themselves who they want to be with or if they want to be with anyone at all. Should I blame myself for secretly watching The Bachelor? My four-year-old was about to learn how to break up with a mermaid like a mensch. Not to gender associate, but I’ve heard sentiments like that before. I lost him on that last one. What breakup excuses had I used? “Or they’ve just grown apart and he wants to just be friends.” Whoever believes that one? Was I really having this conversation with a four-year-old? Well, he started it. “What if Ariel wants to break up, too,” Spense said, “so she’s not hurt?” Smart. We resumed the game with an amicable breakup. This time, Ariel was not only unscathed but also joyful and relieved. He asked me to dial down that part. Prince Eric went back to the other mermaids, whom he’d now placed in a plastic cup of bubbles. Flash back to college when I asked out a guy moments after I’d broken up with my boyfriend. 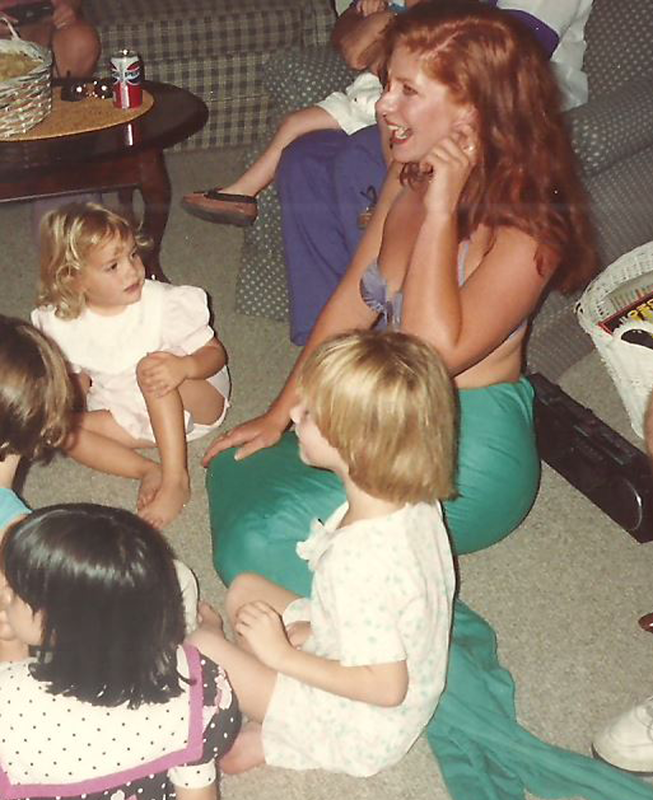 Ironically, at the time I was dressing up as Ariel for children’s birthday parties. It’s therapeutic for young children to make believe freely and feel powerful in play. I usually let him control the game—often resulting in heinous murders and genocide of my characters. But sitting on the cold floor tiles, wet and hunched over, I felt it’s never too early to teach kindness. I was going to suggest that Prince Eric take some time to be alone, but I thought that might be too advanced. He’s only four. We have time to work on this. On some level, does Spense worry about me because I’m solo? Is he worried about the lack of love he sees in his mother’s life? “Spense, what would you think if I had a boyfriend?” I asked. As I struggle with my own vulnerability and whether or not I’m ready to brush off past relationship failures and try again, what I really want is to protect my boy from pain. But, it’s pain that brought me here—to this bathroom floor, to being a Solo Mom, to refusing relationships that weren’t right. I now have the greatest love of my life. Feeling the hurt and coming though it has made me buoyant. Have you been to Sister Chat for information and support? See if it’s right for you! Evie Peck is an actor, a writer, and a producer living in Los Angeles. Before she became a mom, she cowrote and performed the hit play about bad dates called I Made Out With Him Anyway. She blogs at www.momsolo.com.